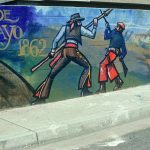 Honoring César Chávez, March 31, 2017 – ¡Murales Rebeldes! Mural detail, Emigdio Vasquez, The Legacy of César Chávez (1997), Santa Ana College, California; http://chicanoartmovement.com. César Chávez died with an art book in his hands. This final image of the great visionary is appropriate and poetic — because he and his struggle for justice were intimately intertwined with creative expression by Chicano visual and performing artists. The life of civil rights activist and labor leader César Chávez is well documented and recognized every year on March 31. However, his legacy is also honored in art and murals throughout the region. 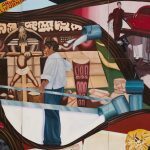 In recognition of César Chávez Day and of the many Chicana/o muralists who have preserved his legacy in their works, we offer a few examples from our forthcoming book, ¡Murales Rebeldes!—L.A. Chicana/Chicano Murals under Siege, copublished with LA Plaza de Cultura y Artes in collaboration with Angel City Press (September 2017). 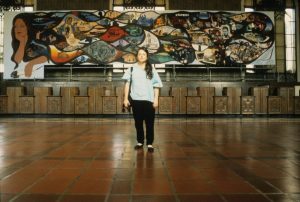 The book tells the stories of eight Chicana/o murals that were censored, whitewashed, neglected, and even destroyed and examines the impact on the artists and the Chicana/o communities in which they were painted—and, more broadly, on Los Angeles’s cultural and historical heritage. Emigdio Vasquez, Memories of the Past and Images of the Present (1978), 1995. Courtesy Emigdio Vasquez family; photo: Gloria Ortiz. In 1978, Emigdio Vasquez, winner of the prestigious Maestro Prize, painted Recuerdos del pasado y imagines del presente (Memories of the Past and Images of the Present) on the wall of the Iberio American Market in Anaheim. The mural traces Mexican history from Zapata to César Chávez (far right). 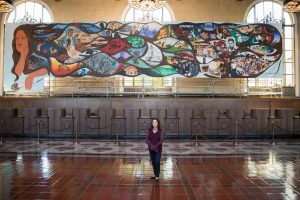 At 13 x 106 feet, it is the largest of nearly two dozen murals the celebrated Chicano fine art painter and muralist created in the barrios of Orange County where he lived. This mural, which still exists, illustrates the foreword of the book by Orange County journalist Gustavo Arellano. Mural detail, Sergio O’Cadiz Moctezuma, Fountain Valley Mural (1974–76). Courtesy Private Collection of the O’Cadiz Family; © O’Cadiz Family Private Collection. 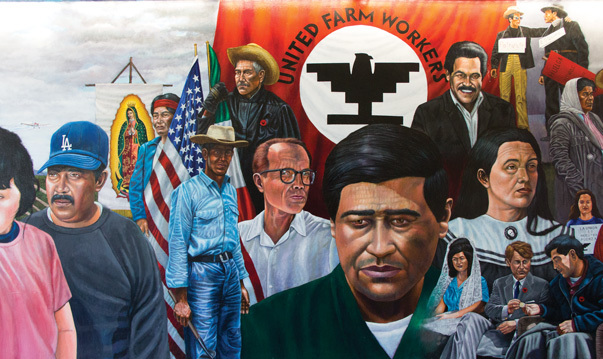 The logo of the United Farm Workers, co-founded by activists César Chávez and Dolores Huerta, was represented on one of the approximately twenty-five scenes that made up Sergio O’Cadiz Moctezuma’s 6 x 625-foot mural in Fountain Valley’s Colonia Juarez. 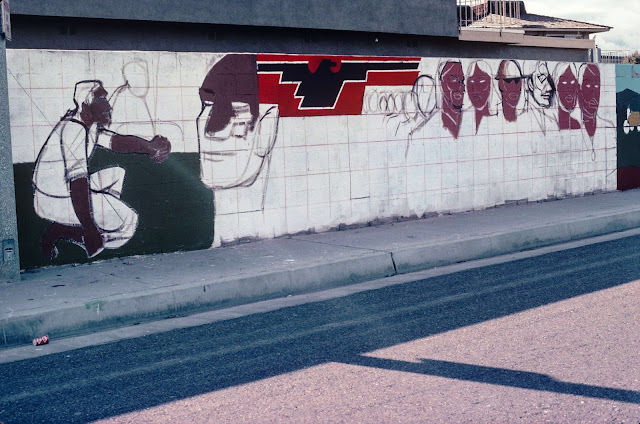 The mural, which told the history of Mexican Americans, was destroyed in 2001, when a bulldozer razed the wall on which it was painted and a higher wall was built in its place. The UFW logo was conceived by Chávez’s brother Richard in 1962, when Chávez and Huerta founded the UFW. 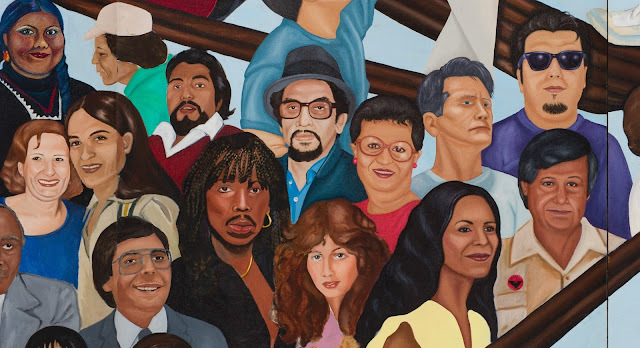 Mural detail, Barbara Carrasco, L.A. History: A Mexican Perspective (1981). Courtesy LA Plaza de Cultura y Artes/California Historical Society; photo: Sean Meredith. 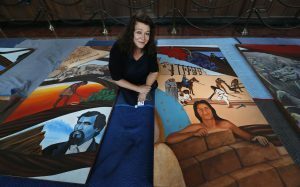 Barbara Carrasco’s mural L.A. History: A Mexican Perspective was censored due to the artist’s inclusion of controversial aspects of the city’s history, particularly regarding its minority populations. 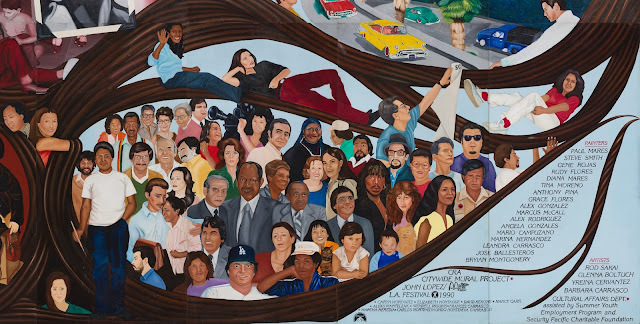 In this section of the mural, César Chávez (far right, featuring the United Farm Workers logo on his shirt) is grouped with other city leaders and activists, including Mayor Tom Bradley, Jane Fonda, fellow muralist Yreina D. Cervántez, and Dolores Huerta, with whom he cofounded the UFW. Carrasco first met Chávez (far right) as a 19-year-old university student. “I immediately volunteered my services to him,” she recalled in an oral history. “I would work with him for fifteen years,” creating drawings, flyers, and banners for UFW conferences.